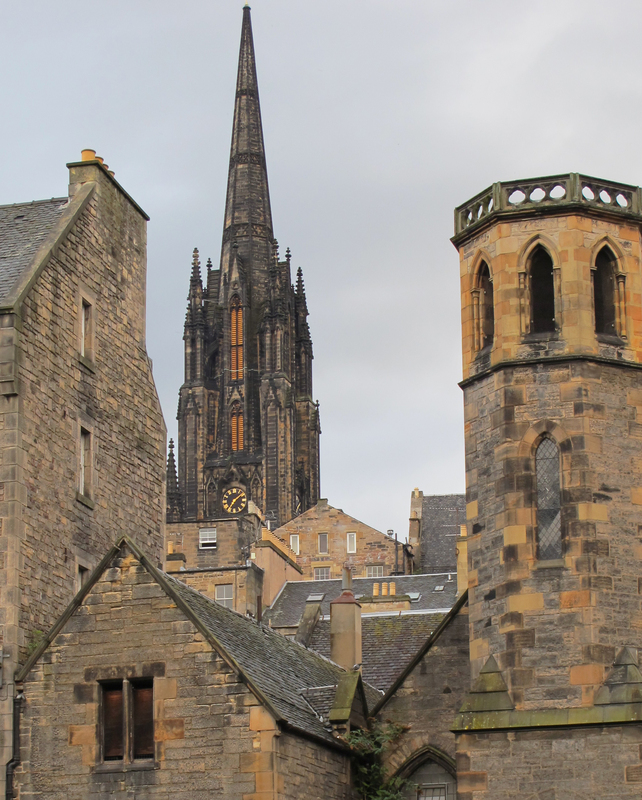 A Report from the Edinburgh Fringe Festival | Notes from the U.K. 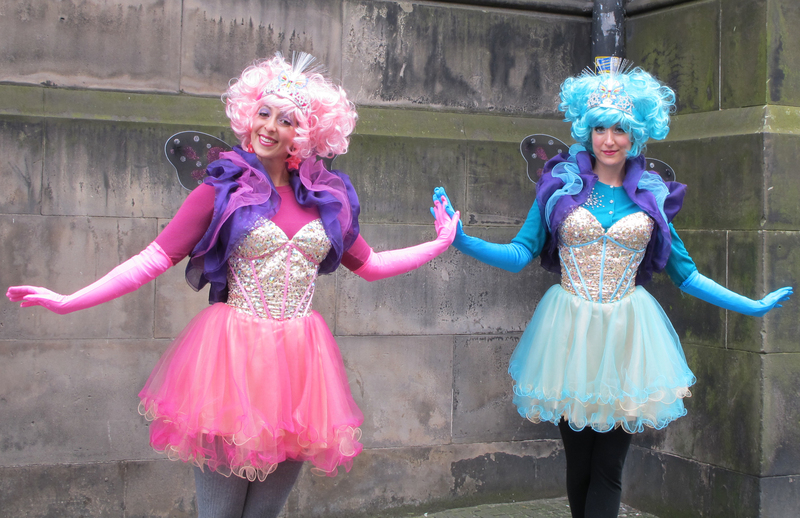 The Edinburgh Fringe Festival runs for most of August, and a wondrous mess it is. You want good theater, street theater, cutting-edge theater, dive-under-your-chair bad theater, awkward student theater? It’s all there, along with pretty much anything else you can put on a stage or a sidewalk. Swarms of actors, comics, singers, wish-they-were-singers and –Britishism warning –punters* condense on the city the way starlings condense on a power line, the entire flock tightening its formation until the cable feathers out along its length and the sky’s clear of birds. Which, minus the wish-it-was-poetry, is a way of saying that during the festival Edinburgh’s sidewalks are jammed beyond capacity and the traffic’s hopelessly snarled. As far as I can figure out, Edinburgh’s residents either find a way to make money out of the mess or hide under their kitchen tables the way we were taught to do when I was a kid, in case of nuclear attack. They come out as soon as we go home. They probably hold a celebration. In secret, so we won’t come back and crash the party. Wild Thing and I joined the mobs for the better part of a week, but I’m not going to review anything we saw. The role I assigned myself when I started blogging was to explore the spidery corners of the culture, and the Fringe has so many reviewers that no spider would dare spin its web. So many, in fact, that I believe every show got a five-star review from someone. One had six stars. For all I know, they stitched those together from three two-star reviews. Or maybe it was six stars out of twenty. It’s hard to know what any of it means. I didn’t go. If there isn’t already a publication charging for good reviews, someone could make a buck or three (sorry: 60 p. or 1.8 quid) by starting one. You wouldn’t even have to write words, just award stars—lots of stars. For all that I go to the Fringe for the theater, and I’ve seen some great shows, the Fringe, for me, is also about coffee shops. Damn, I miss writing in coffee shops. Our village has a couple of cafes, and in the off season I wouldn’t get thrown out if I rooted myself in a corner and wrote in one of them, but I know too many people there, and that destroys the illusion of invisibility which I need to write in public places. My favorite Edinburgh coffee shop this year was crowded enough that people shared tables, and on my first morning, I sat with an American who lives in Edinburgh. He worked on his computer; I wrote longhand, and we pretty much ignored each other. Then an English woman joined us. She’d come up for the Fringe, and we talked until my extremely large teacup jumped out of my hand, hurling tea on her and me and my notebook and, by sheer dumb luck, not the other American’s computer. As spills go, I’d award it four stars out of five, and since I was traveling light I wore that bit of history on my jeans for the rest of my stay, and I did look gloriously casual in them, if not outright messy. We mopped up what we could, a man appeared from behind the counter with a massive wad of blue paper towels—enough to dry up some municipal fountain somewhere—and the American packed his computer and left. In the friendliest possible way. What little tea I had left in my cup—and it was only enough to keep the spill from earning that fifth star—had turned cold by now and I sipped it slowly, for its caffeine content alone. A second American sat down and the three of us talked. He turned out to be the producer of a Fringe show. The English woman and I duly swore we’d go see it. I, it turned out, was lying, but I didn’t know that at the time. I did mean to. Then I did some obnoxious self-promotion and handed out the address of my blog, which they duly swore to look at. In case either of them actually does, I’d like to say that they were personable and interesting and I enjoyed sharing a table with them. And I really am sorry about the tea—and about not getting to that show. In the middle of all this, I got a surprising amount of writing done and I managed to keep believing I was invisible. Even when I knocked over the sugar on my way out. The human brain is a strange and fascinating thing, with a great gift for self-delusion. It took me a minute: The Fringe was ending in four days. Unemployment was beckoning, and he’d reached the point where it looked good. 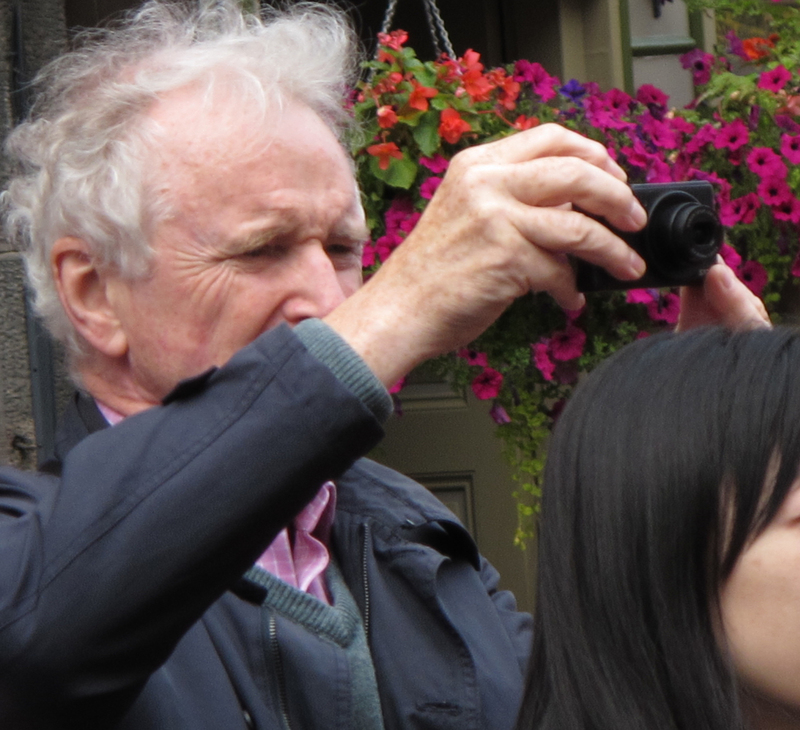 The Fringe is also a great place to people watch. The street-theater areas are populated by folks watching the world through their cameras. Expensive cameras with lenses as big as I am. Palm-size pink cameras full of sparkly stuff. Phone cameras. iPad cameras. They watch a street performer only long enough to take a picture, then they move on, 80% of the time without leaving money in the hat. The picture matters. The performer doesn’t. We’re all our own performers these days, gathering up the scraps of our experience, arranging them, imagining the audience they’ll find, barely letting the other performers take root in our consciousness. And having said I don’t do reviews—yeah, I lied about that too, but I’ll be brief. If you live in the U.K. and get a chance to see anything by Theatre Ad Infinitum, go. They’re amazing, and they’ll be touring. Out of five stars, I’d give them six. *Punter: A customer, client, or audience member. Also someone who places bets or a prostitute’s client. Aren’t you glad to know that? 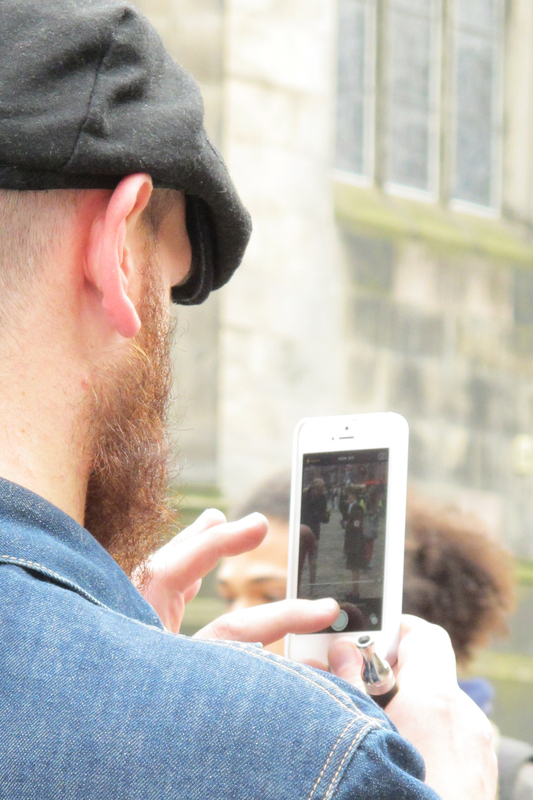 This entry was posted in Other Stuff and tagged Americans in Britain, Americans in England, Edinburgh Fringe Festival, street performance, street theater, Theatre Ad Infinitum by Ellen Hawley. Bookmark the permalink. The Fringe Festival, the Military Tattoo and (after that) the Braemar gathering are still high on our bucket list. The place where we stayed is pretty much right under where the Tattoo takes place, and the pattern is this: Just about the time we’re dozing off, they shoot off fireworks, cannons, and for all I know howitzers and surface-to-air missiles. With each one, we go airborne, even once we’re supposedly used to it. I’ve never visually seen the Tattoo, but I do feel like know it already. All too well. Sorry to hear of that experience. But thanks for sharing. Helps me to decide where (not) to stay when some time we’ll be over there. After splattering ourselves on the ceiling a few times, we did come to think it was funny. But if you want peace and quiet, don’t stay near the Grassmarket. The Fringe is fantastic, though. I hope you like it. When we were there in early 2013, we stayed somewhat outside, near the harbour, and usually took the bus in – very convenient and quick. But sometimes we also walked. Only 45 minutes, and very interesting.